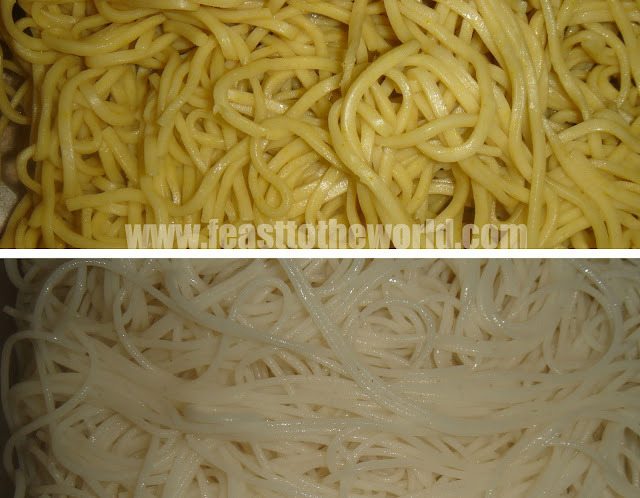 This is the dish I always think of whenever I come across any menu that boast a 'Singaporean Noodles'. 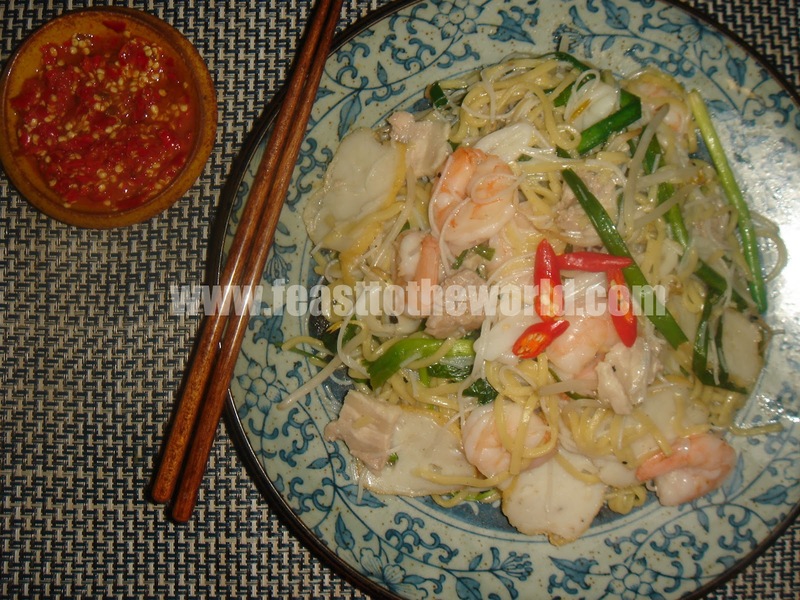 Simply because there is in truth no such thing as a Singapore noodles. Or should I say, there is but not as you know it, thanks to all these bastardised concoctions of luminous yellow-tinted rice noodles. The infamous dish itself came from not Singapore but Hong Kong. The only reason why it is called Singapore noodle is because of the inclusion of curry powder in the ingredients. This fusion of Chinese and Malay style of cooking is indeed very much a Singaporean cuisine style. But truth to be told, I have never eaten this bright yellow bee hoon (rice noodles) dish anywhere in Singapore.....ever! 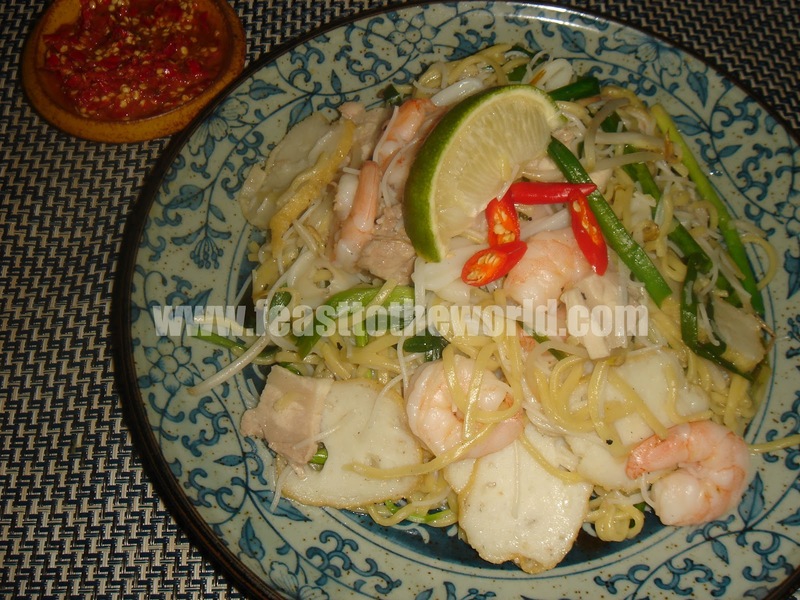 Singpore Hokkien Mee on the other hand, is a genuinely authentic 'Singapore noodles'. This is widely popular and is available from all hawker centres dotted around the country. A particular favourite of mine as I recalled many a late nights feasting at this brothy stir-fried treats when I was studying and prepping for my examination. Very often, I would be peckish and popped down to my local hawker centre to da bao (takeaway) a packet of this for my midnight supper, both tasty and nutritious. This is essentially very simple and quick to prepare. The only time consuming part is the making of the pork broth which formed the cornerstone to this delicious noodles dish. Even that requires no efforts at all, just a pan of boiling water and some pork belly. Let it sit simmered for half an hour or so and there you have it - porky-flavoured broth that will liven up your Hokkien mee. The using of fish sauce might sound strange in this dish but unknowing to most, it is actually rather commonly used in a lot of our Singapore favourites such as Chai Tow Kway and Oyster Omelette etc. And of course, I have also included a recipe for the must-have condiment for this noodles, the Sambal blachan/belacan, best made on the day and served fresh. A spicy delight! Pound all the ingredients in a mortar and pestle to a paste or alternatively blitz in a food processor. Bring the water to the boil in a pan over medium heat and add the pork belly. Simmer gently for 30 minutes, turn off the heat and let the pork sit in the stock for 10 minutes. When cool enough to handle, remove and cut the pork belly into thin, bite-size pieces. Reserved 300ml of the stock and set aside. Heat the oil in a wok over high heat until smoking. 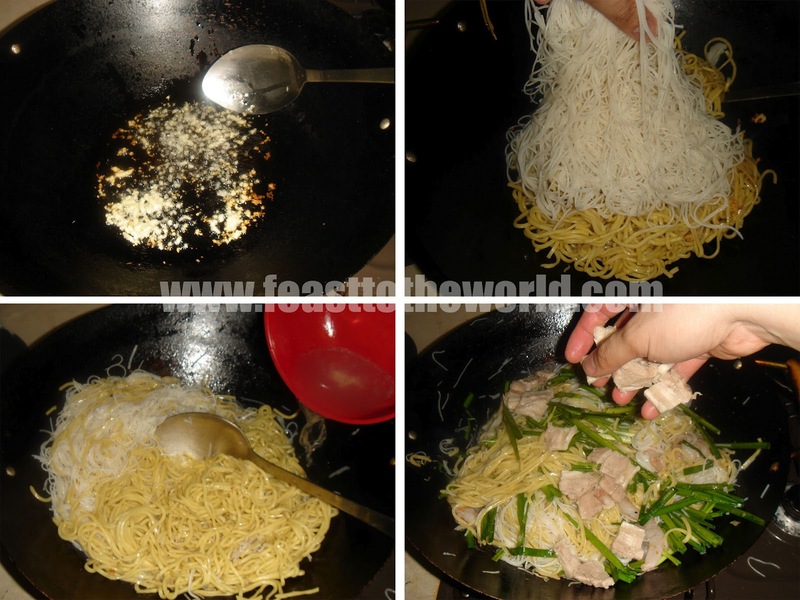 Add the garlic and stir fry for 30 seconds, until golden and fragrant, before adding both types of noodles. Toss the noodles thoroughly to heat through for 2 minutes. Add the reserved stock, prawns, fish cakes, squid, chives and bean sprouts. Stir fry vigorously to combine before adding the fish sauce, black pepper and sugar and continue to stir fry for another 3 minutes, until the noodles has absorbed most of the stock. Add the beaten eggs and allow them to set slightly, about 1 minute before turning to combine. 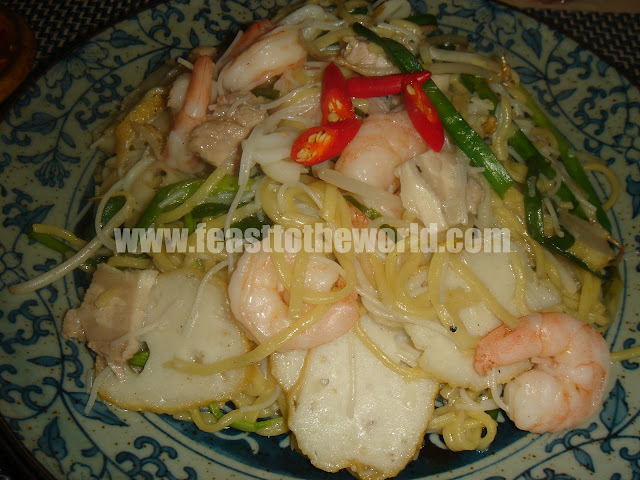 The dish is ready when the seafood are coked and the noodles become moist but not soggy. 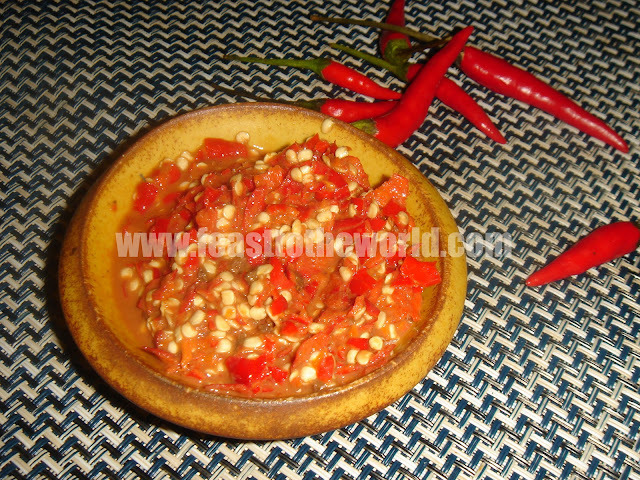 Transfer to individual serving plate and serve with the sambal blachan/belacan lime wedges. Pork belly with shrimp is a great combination!